Blessed Bernard was born on November 7, 1604, as Dominic, the third of eight children of Menica and Joseph Peroni. The family was a poor farming family and by the age of seven Dominic was shepherding the family sheep. 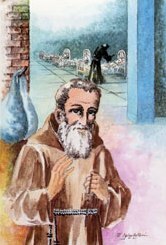 He entered the Capuchin Order at 23 years of age, and received the name, Bernard. He sought to acquire all the most beautiful Franciscan virtues; by competing with those friars he considered the best. During his long life, he served as cook, infirmarian, quaestor, gardener, and porter. Through life's many misfortunes, Bernard cultivated a spiritual outlook that transformed every occasion into a prayer and spiritual opportunity. He was beatified by Pope Pius VI on May 25, 1795. Lord, you gathered all your commandments into the one commandment of love of God and love of our brothers and sister, grant that imitating blessed Bernard, we may dedicate ourselves to the service of our brothers and sisters so that we may be blessed by you in heaven. We ask this through our Lord Jesus Christ, your Son, who lives and reigns with you and the Holy Spirit, one God, for ever and ever.